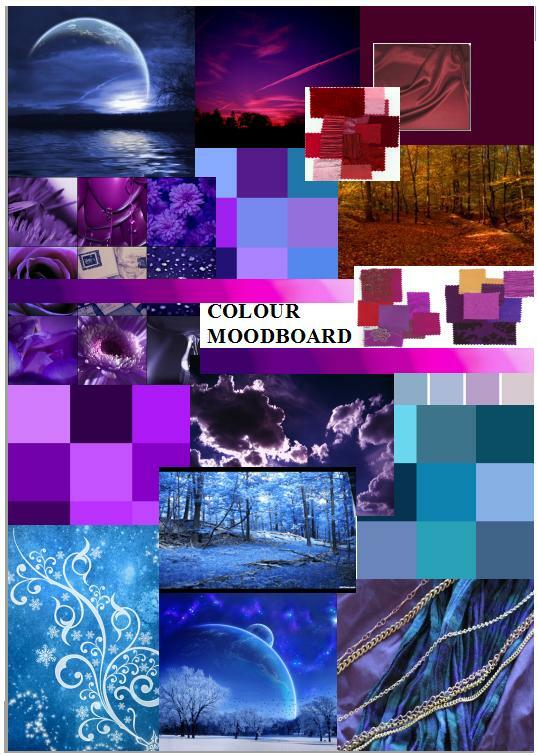 As part of the planning for the colour scheme I am going to try to use throughout my coursework, I have created a small mood board of the colours that I thought suited the fantasy genre. The role of moodboard are to develop the design concepts and to communicate a visual style or route. I have collected images from the Internet of fabric swatches, pretty patterns, fantasy pictures of the moon, landscapes and forest locations. I believe all these relate to the particular genre and have been seen used in example film posters that I have researched. Orange and Red show the autumn season and as it is the autumn,winter season now, I can really make use of the trees and the natural light outside whilst shooting my film and taking pictures for my print products. I have decided to have a Blue and Purple colour scheme as they usually suggest mystery and can symbolise imagination, creativity and magic. The use of a full moon would be greatly beneficial as it clearly shows the time in the day but this will only work if it is actually out. The mood board also emphasises the make-believe nature that I want all my products to contain and I will try hard to make this happen. I have quite enjoyed putting the mood board together; It has helped me in deciding the type of font I could use due to the shapes I can see in the pictures such as round and curly.